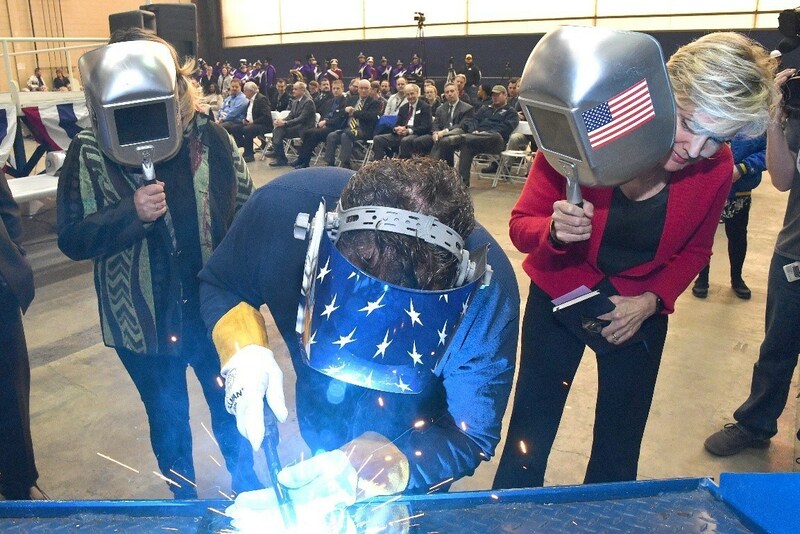 In a ceremony that formally marks the beginning of a ship’s construction, Lockheed Martin and Fincantieri Marinette Marine laid the keel on Littoral Combat Ship (LCS) 25, the future USS Marinette. During the ceremony, the ship’s sponsor Jennifer Granholm, former governor of Michigan, had her initials welded into the ship’s keel plate. Unique among combat ships, LCS is designed to serve a variety of missions today, and is easily adapted to serve future and evolving missions tomorrow. It is flexible – with 40 percent of the hull easily reconfigurable, LCS is designed to serve today’s missions and can be outfitted with additional and evolved capabilities, including over-the-horizon missiles, and advanced electronic warfare systems and radars. It is lethal – standard equipped with Rolling Airframe Missiles (RAM) and a Mark 110 gun, capable of firing 220 rounds per minute. It is fast – capable of speeds in excess of 40 knots/46 mph/74 km/h. It is automated – with the most efficient staffing of any combat ship. «LCS brings something really special to the Navy. There is no other class of ship that delivers this level of flexibility for future missions», said Joe DePietro, vice president and general manager of Small Combatants and Ship Systems. «LCS is minimally manned, so the U.S. Navy can efficiently project presence around the world. It really is a remarkable ship, and our team is so proud to begin construction on the future USS Marinette for the Navy». USS Marinette (LCS-25) will be the first U.S. Navy ship to bear the name Marinette, and is named to recognize the town’s significant contributions to Navy shipbuilding. Fincantieri Marinette Marine began operations in 1942 to provide U.S. ships for World War II. Marinette is the birthplace of Lockheed Martin’s Freedom-variant LCS, which Lockheed Martin and Fincantieri Marinette Marine have partnered to produce for more than 16 years. Each day, more than 1,500 residents of Marinette, Wisconsin and Menominee, Michigan, enter the Fincantieri Marinette Marine shipyard to build LCS. «We are thrilled to build the future USS Marinette. As shipbuilders, we transform flat panels of steel into warships, and feel so much pride in the craftsmanship required to do this important work. It is an honor to be able to do that for the ship named after our hometown», said Jan Allman, president and CEO of Fincantieri Marinette Marine. «The Navy selected an incredible woman to sponsor our ship. Governor Jennifer Granholm represents a large number of our workforce coming from Michigan, and she has been an avid supporter of the LCS program since its inception». USS Marinette (LCS-25) will be the 13th Freedom-variant LCS, and will join a class of more than 30 ships. She is one of seven ships in various stages of construction and test at the Fincantieri Marinette Marine shipyard.